Following the announcement that it is set to house approximately 1.6 million more inhabitants by 2030, the Singapore government has today unveiled its blueprint for achieving so. The plan involves intensifying its land use, developing reserve land and recycling low utility areas such as golf courses and old industrial sites. Singapore currently has 5.3 million inhabitants living on 71,400 hectares (ha) of land. By 2030, about 5,200 ha of land area will be made available, led by reclamation projects in Pulau Tekong (2,000 hectares), Tuas Port (1,700 ha) and Jurong Island (600 ha). New residents can look forward to 700,000 new residences by 2030, of which 200,000 will be ready in three years’ time. New towns such as Bidadari, Tampines North and Tengah will respectively offer 12,000, 21,000 and 55,000 new residences over the next 2 – 5 years. The number of residences in Punggol will also increase three-fold to 96,000. In addition, the Central Region Bukit Turf Club, Kallang Riverside, heritage area Bukit Brown and Keppel waterfront will be turned into living spaces. In a bid to support a vibrant economy with good jobs, some space will be carved for commercial as well as manufacturing use. Outside of the city-centre, at least 13 million sqm of commercial space will be developed to supplement existing commercial nodes such as Jurong Lake District, one-north and Paya Lebar Central. Closer to the east of Singapore, the Changi Business Park, Tampines Regional Centre and Lorong Halus area will be expanded. In the north of Singapore, the North Coast Innovation Corridor spanning between Woodlands and Punggol will be developed as well. We hope, however, that these projects are sustainable and do not take a toll on our environment. It would be good to reserve some natural green spaces and heritage areas as we work towards building a more dynamic Singapore and making a home that still has a deep connection to its history and its roots. That said, we anticipate that with the inflow of new citizens, Singapore permanent residents and qualified Singapore work visa holders, our cultural make up will be more diverse and colourful. This in turn would make Singapore more socially vibrant and interesting place to live in. 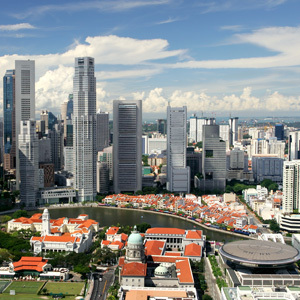 In the heart of Singapore’s business district , the CBD, will be extended to Marina Bay. The area will see at least another million square meters (sqm) of prime office space. For manufacturers, Woodlands, Sengkang West, Seletar, Pasir Ris and Tuas will be developed for use. “We hope, however, that these projects are sustainable and do not take a toll on our environment. It would be good to reserve some natural green spaces and heritage areas as we work towards building a more dynamic Singapore and making a home that still has a deep connection to its history and its roots. That said, we anticipate that with the inflow of new citizens, Singapore permanent residents and qualified Singapore work visa holders, our cultural make up will be more diverse and colourful. This in turn would make Singapore more socially vibrant and interesting place to live in,” she affirmed.